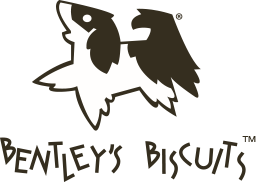 By using only the finest ingredients, Bentley’s Biscuits promises intensely flavored, healthy and tasty treats, that you can feel good about giving your best “friends”! Highest quality, human-grade, all natural ingredients. Low in calories, fat and “carbs”! NEVER any corn, soy, preservatives, chemicals, added sugar, salt, artificial flavors, colors or fillers. Handmade and baked in the USA with “hands on” quality control. If you have been searching for a healthier alternative in a gourmet dog treat, look no further! Ahh, the smell of fresh roasted peanuts! Dogs go crazy for peanut butter! Made with: The highest quality all natural, unsweetened 100% peanut butter, mixed with rolled oats, whole wheat flour and fresh eggs. Made with: Whole pumpkin, rolled oats, whole wheat flour, cinnamon and fresh eggs.